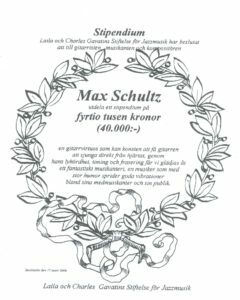 Gitarristen, musikanten och kompositören Max Schultz tilldelades 2006 ett stipendium från Laila och Charles Gavatins Stiftelse för Jazzmusik med motiveringen: "En gitarrvirtuos som kan konsten att få gitarren att sjunga direkt från hjärtat, genom hans lyhördhet, timing och frasering får vi glädjas åt ett fantastiskt musikanteri, en musiker som med stor humor sprider goda vibrationer bland sina medmusikanter och sin publik." After having attended a Jimi Hendrix concert, Max Schultz at the age of ten began learning the guitar. One year later he started playing the electric guitar and together with some school friends formed a band playing gigs around town. He played for a while with the reggae band, Jah-maica, before joining the multi-faceted group Mynta, led by bassist Christian Paulin. He stayed with the group for seven years, gaining much experience and playing all over the world at festivals, not only in Stockholm but Montreux, Singapore, Bombay, New Delhi, Cuba and Nicaragua. In 1988 he played with pianist Herbie Hancock and even recorded an album with him in 2001. At the beginning of the ‘90s he joined saxophonist Håkan Broström’s group, In and Out, making two albums with them. 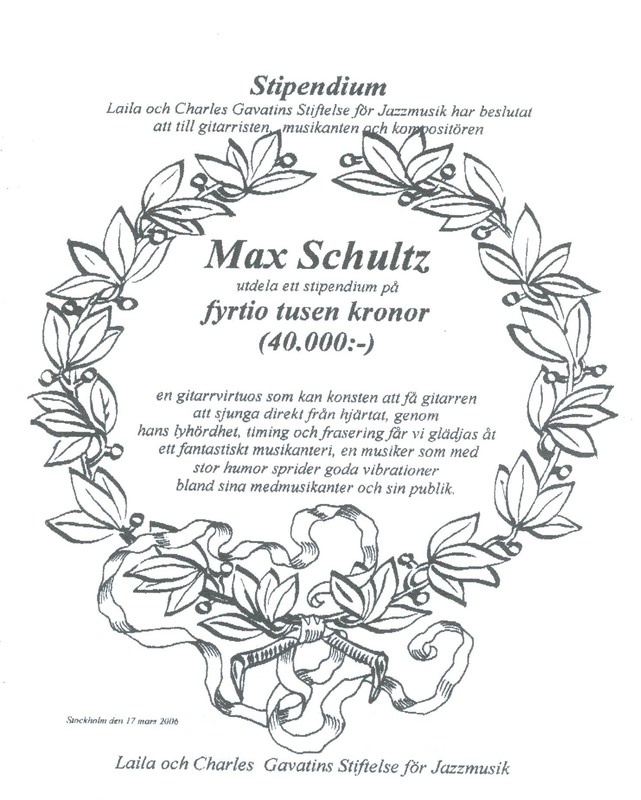 The Nineties was a very busy period for Max and he formed the Max Schultz Band and was chosen to make the annual “Jazz In Sweden” album for 1993. By this time he had become one of the most highly regarded guitarists in Sweden, his playing encompassing a broad range of genres for both electric and acoustic music, and the list of artists with whom he works (in many cases recording) has increased steadily, including singers Rebecka Törnquist, Victoria Tolstoy, Svante Thuresson and Tommy Körberg and such instrumentalists as organist Pierre Swärd, trombonist Nils Landgren, saxophonist David Wilciewski and pianist Esbjörn Svensson. In 2006 Max received a scholarship from Laila and Charles Gavatin's Foundation for Jazz Music. The same year he won the Guitar People’s Prize and was presented with an acoustic guitar specially built by David Sundberg.